So I’m doing RideLondon 100 again this year but this time I’ve struck lucky and am doing it as a guest of Skoda. Here’s my account of the first ride. 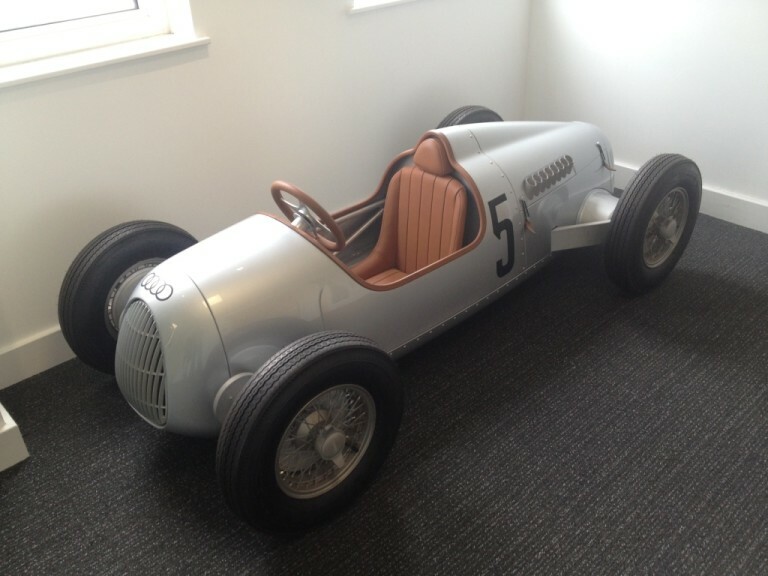 As you may have noticed, Skoda are involved with many teams and many races throughout the year including the biggie – the Tour de France. There are a team of 25 of us in total riding the RideLondon event for Skoda and in preparation they supplied us with all the necessary kit. 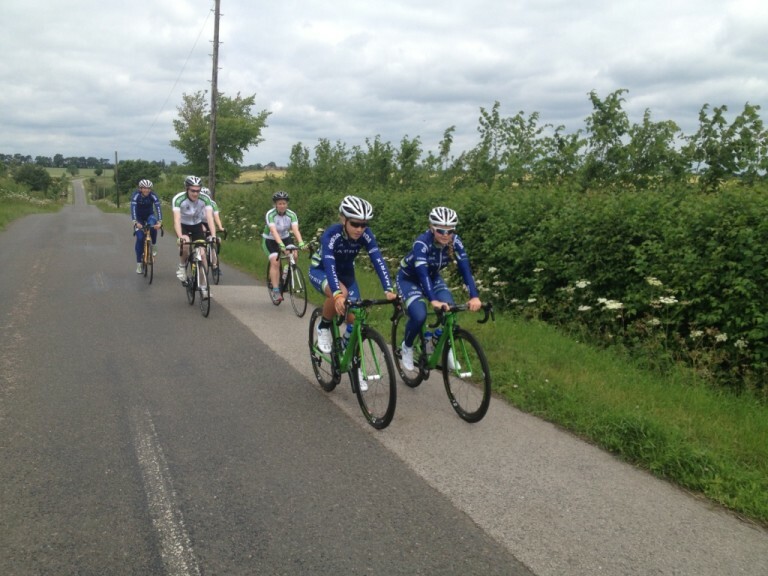 They also held a day out with the Matrix Fitness professional cycling team for us. Basically several of us lucky one went along to the Skoda UK headquarters yesterday and were treated like professional riders for the day. Bikes were checked and kit handed out. 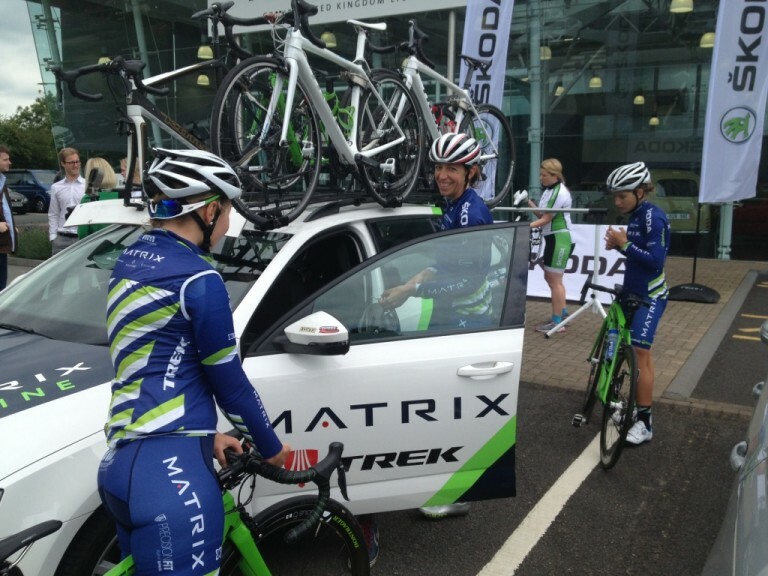 Then it was time for a spin with three Matrix Fitness riders Harriet Owen, Helen Wyman and Kim Le Court. 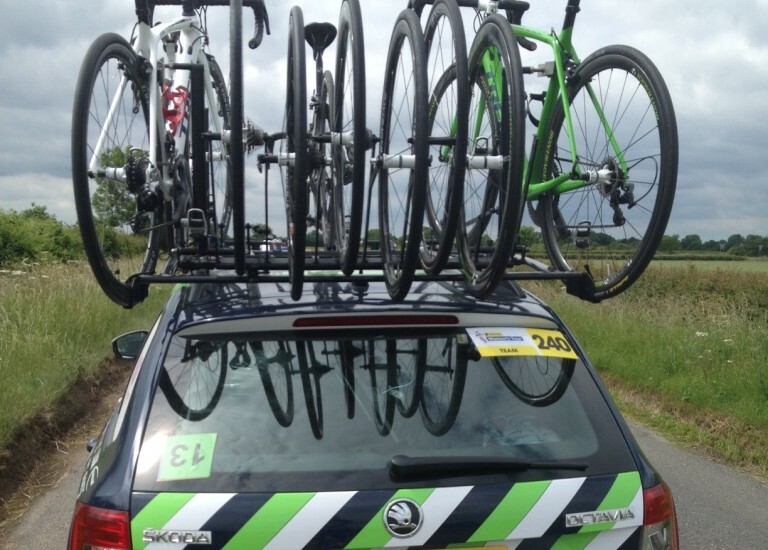 Just to add to the atmosphere we had a team car following us with spares and drinks as well as bikes and wheels. Whit-woo! It was a leisurely 2.5 hour ride out into the lanes and quiet countryside close to but what seemed like a world away from the busy wide roads of Milton Keynes. This gave us a chance to quiz the riders about life as a professional and the races they have done this year. 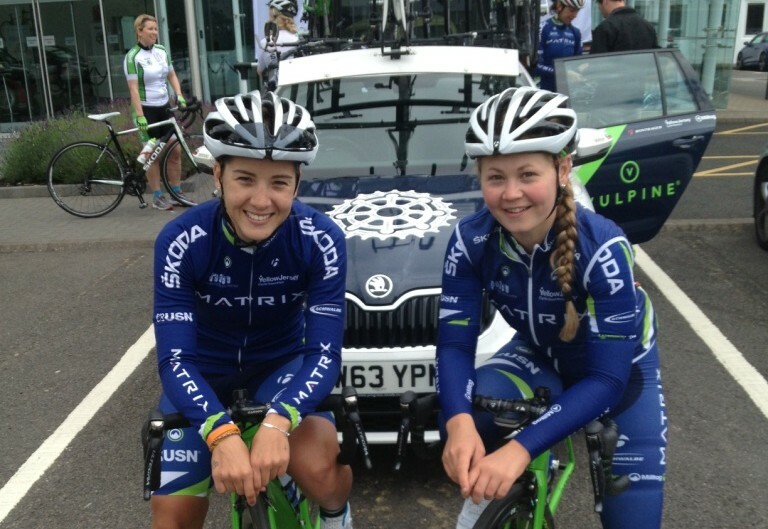 Helen Wyman and Kim Le Court (left in the pic below) had only just completed the Aviva Women’s Tour two days previously where Helen finished in 66th place overall and Kim 83rd and lantern rouge. Bearing in mind Kim is only 19 years old and in her first senior season this is no mean feat against the best female riders in the world. Harriet Owen (right in the above pic) is returning from a hand injury sustained in a race in Belgium a few months ago. Thankfully this combination of factors meant they were all down for an easy session and we weren’t complaining! It was so good to just ride along on quiet roads, in decent weather with everyone there just happy to be out on their bikes. This is quite a rare treat for the professionals. 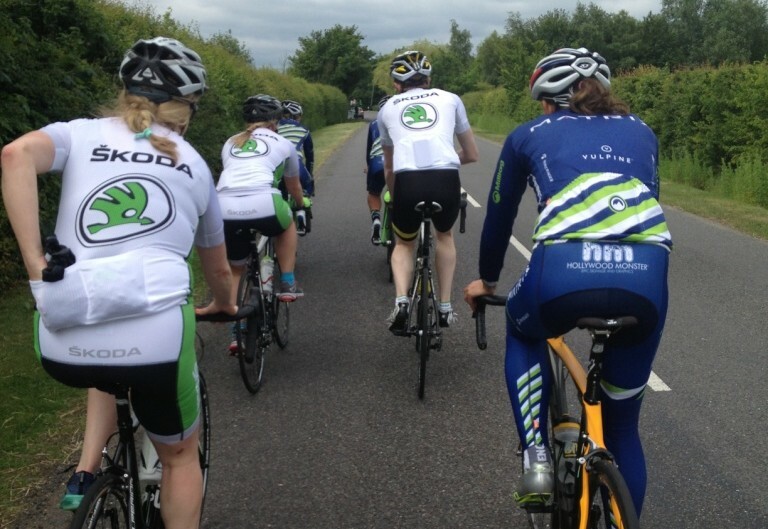 Their training is so structured that every ride usually has a particular objective. What struck us mortals was the fact that the professionals were just happy to be out on their bikes in the countryside with a bit of banter like all cyclists do. This reminded us that even though it is their livelihood, they still basically enjoy riding their bikes. 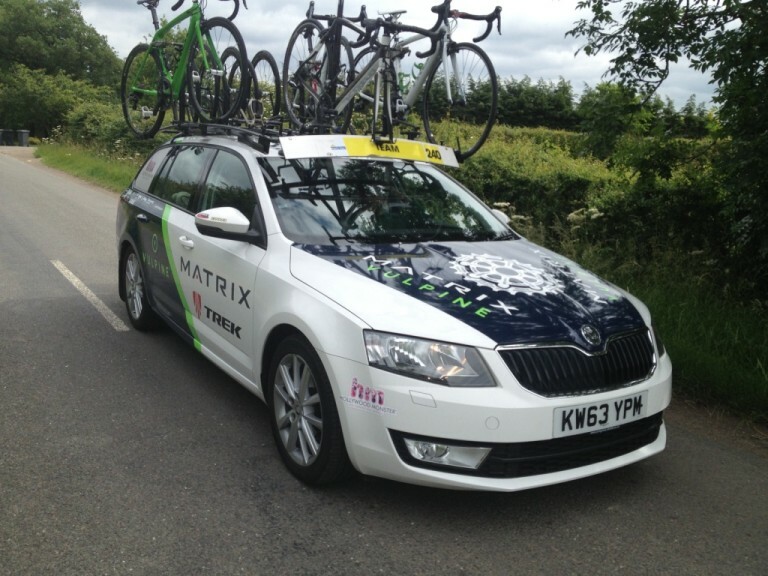 The Matrix Fitness team car which accompanied us was fresh from the Aviva Women’s Tour with relevant official stickers. Check out the upside down No.13 sticker on the back windscreen – a cycling tradition – which was the team car position in the race convoy during the race. At the end of the ride we adjourned to a quaint country pub for lunch. The professional riders joined us but this time though their training kicked in and they had a much, much more healthy lunch than the rest of us amateurs. What tips did we take for the RideLondon? Simply get out on your bike, get the miles in and most importantly enjoy it. Tagged aviva women's tour, pro cycling, racing, ridelondon, skoda. Bookmark the permalink.